Doug, Until you mentioned it, I have never noticed this sign before. Google Street view shows the sign is still there. I have been searching so far without success, to see if there are any other old photographs showing this view. Hopefully if someone knows of such a picture it might help to date the origin off this sign a little. My best guess is it was placed there by the shop owners themselves in a bid to increase trade. There was a similar attempt at this sort of thing on the Green Street/Barking Road junction. A previous business called Evans had a large sign with the words' Evans Corner' written on it placed on a flank wall. It never caught on as a name, as everyone knows that junction as The Boleyn. The sign is still there though and can be seen by pasting the following link into your browser. Never knew this as The Broadway.When we got on a bus from Greengate,we always said East Ham Town Hall,when asked for destination. I found a photo of the same area on The Memories of Manor Park and East Ham FB Group. Unfortunately the photo which was taken in the 1920s or 30s (Tramways are still visible) and shows the shop that was there before Hawkins is quite poor and you cannot see if the wording "The Broadway" appears at roof level. As Mick said it was quite common for shops to try to get major road junctions name after them like Evans at The Boleyn and there was also Culls Corner at the junction of High Street North and Gladstone Avenue. I came across this picture on Facebook by chance. 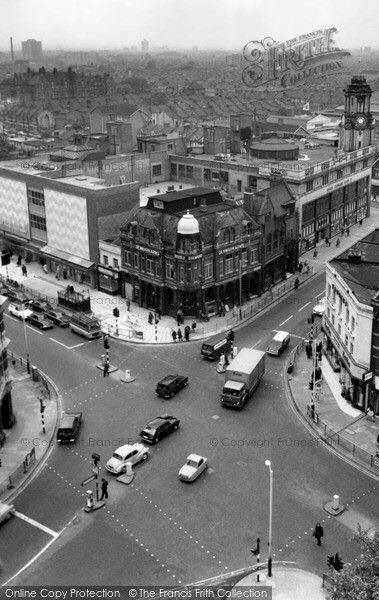 It is a view taken from East Ham Town Hall in 1965 look towards High Street North. Hawkins can be seen on the corner on the right of the picture. It's rather tantalising as the angle of the shop front of Hawkins does not allow a direct view. I have however looked at this picture with a image magnifier and the words 'The Parade' do not appear to be there. Although it would not be possible to read the words at this angle, given the letter size, I think a dark like would appear in the picture which it does not. The date of the picture with the name 'The Parade' was taken in 1972. If I am correct the words were not there in 1965 the they would have to appeared sometime in the next seven years. 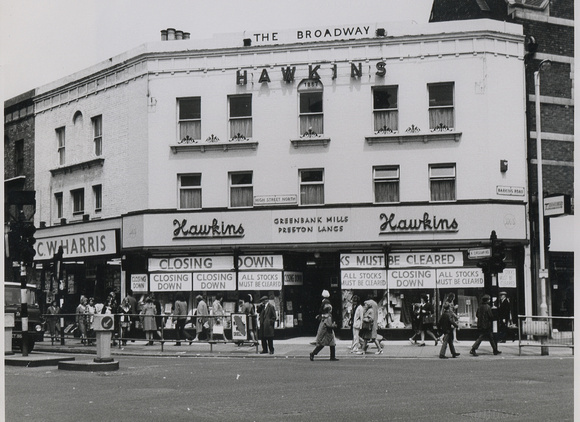 I have got an old photo which is quite clear showing Hawkins with The Broadway written at the top. I don't know the year though. Unfortunately we still can't put photos on the Forum. Ps I can't remember ever hearing anyone refer to East Ham Broadway. Like Stratfford broadway,, Which to my knowledge was opposite the courts in west ham lane next to the picture house .. Page created in 4.175 seconds with 23 queries.